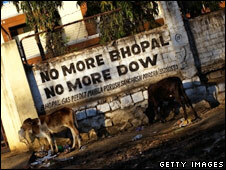 Indian officials have dismissed claims that the former Union Carbide pesticide plant at Bhopal is still leaking dangerous toxins into drinking water. The chief minister of Madhya Pradesh state was speaking 25 years after the world's worst industrial disaster. Chief Minister Shivraj Singh Chouhan told the BBC the plant was safe, contradicting claims in a new report. Thousands died after 40 tons of deadly methyl isocyanate gas leaked from the US-owned plant on 3 December 1984. Half a million people were exposed to the gas. Many have suffered life-long chronic illness as a result. 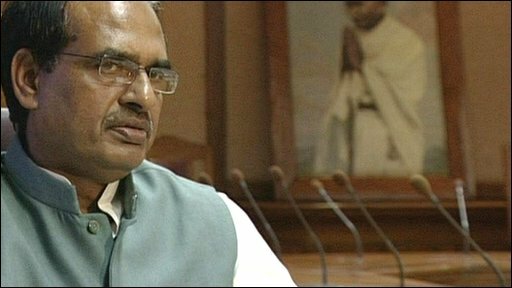 Mr Chouhan said that neighbouring communities near the site had been supplied with clean drinking water. "It took some time," he said in a BBC interview ahead of the 25th anniversary of the disaster on 3 December. "But we managed this quickly, and we can say that we are providing 100% clean water." However, a report published by the British-based charity the Bhopal Medical Appeal (BMA) and the Sambhavna Clinic in Bhopal says there is evidence that "there are still high levels of toxic chemicals in the drinking water supply in 15 communities near the old Union Carbide pesticide plant". The report says the water "in and around the Union Carbide factory site in Bhopal still contains extremely unsafe levels of carbon tetrachloride and other persistent organic pollutants, solvents, nickel and other heavy metals". "Not surprisingly," the report claims, "the populations in the areas surveyed have high rates of birth defects, rapidly rising cancer rates, neurological damage, chaotic menstrual cycles and mental illness." Mr Chouhan insisted that clean water was supplied by tanker to those communities without piped water. But many residents said that supplies were infrequent and insufficient, forcing them to continue relying on contaminated ground water. Sathyu Sarangi, of the Sambhavna Clinic, told the BBC much of the problem arises from areas known as solar evaporation ponds, which he claimed Union Carbide used before the disaster as dumping grounds for toxic effluent. "We have ample evidence," he said, "that there are many toxins still in the ground that have never been cleaned up. "Each time it rains, the rain washes those toxins into the ground water, which many people still draw to drink." Chief Minister Chouhan said the Union Carbide plant had been made safe, and that the government was planning to turn it into a memorial site, to be opened to the public. there was a question as to what to do with the pesticide waste. We took the instructions of the Supreme Court as to how to dispose of that waste. people should not be worried. We have secured the site." Union Carbide is now a subsidiary of US firm Dow Chemical. The government of Madhya Pradesh state took over running the site in 1998. A Union Carbide statement said: "The groundwater issue at the Bhopal site is best addressed by the state government of Madhya Pradesh, which owns the site and is responsible for clean-up activities. "Our understanding is that the central and state governments have plans for site clean-up and we're hopeful they will follow through with their remediation plans, including addressing concerns about groundwater."